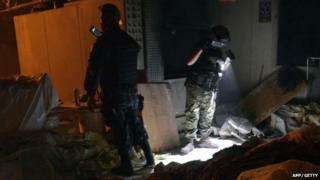 Police have found 60 bodies in an abandoned crematorium in the Mexican resort of Acapulco, officials say. Local media report that neighbours became suspicious of the smell late on Thursday and called police. The bodies of women, men and children were found "perfectly embalmed" and ready for cremation, officials said. Police have opened an investigation into crimes including the desecration of bodies and violating burial and exhumation regulations. The crematorium shut a year ago "due to bankruptcy or failure to pay debts to creditors", the prosecutor's office said on Friday. "With the failure to cremate the cadavers, federal, state and municipal health laws were broken." Officials said that they believed the bodies had been prepared for cremation and then left to decompose after the business closed. Graphic photos of the crematorium show piles of bodies wrapped in dirty sheets on the floor of the building. Local media report that lime had been used over the bodies to try to disguise the smell. Police have asked local funeral homes to get in touch with them if they had sent any bodies for cremation in the last two years. David Jaimes, whose mother died nine months ago, told AFP news agency that he was concerned that she had not been cremated. "I saw the furnace turned on and my mother lying there, but I never saw them put her inside," he said. Some relatives have asked police to analyse the ashes given to them by the crematorium. Chief prosecutor Miguel Angel Godinez told Radio Formula that some documents had been found in the property that "will allow us to conduct various lines of investigation". He added that experts were seeking to determine how long the bodies had been left inside the building. The crematorium is in the state of Guerrero, 200km (124 miles) from the town of Iguala, where 43 students went missing in September.